It looks like Apple is pulling out all the stops for its next entry in the MacBook Pro series. The MacBook Pro 2018 is said to have major improvements in its performance when compared to its predecessor due to the integration of a new Intel processor. The unreleased device is said to have an Intel Core iT-8559U Coffee Lake processor. This particular quad-core chip has a 2.7GHz base frequency that can peak at 4.5GHz. It can also run up to 28W. If the entry is true, it would be the first Apple device to use the Coffee Lake CPU. The model identifier designation in the entry also hints that the next MacBook Pro could be a major revision of the 13-inch variant. It is also becoming increasingly apparent that a 32GB RAM upgrade option will not be available. 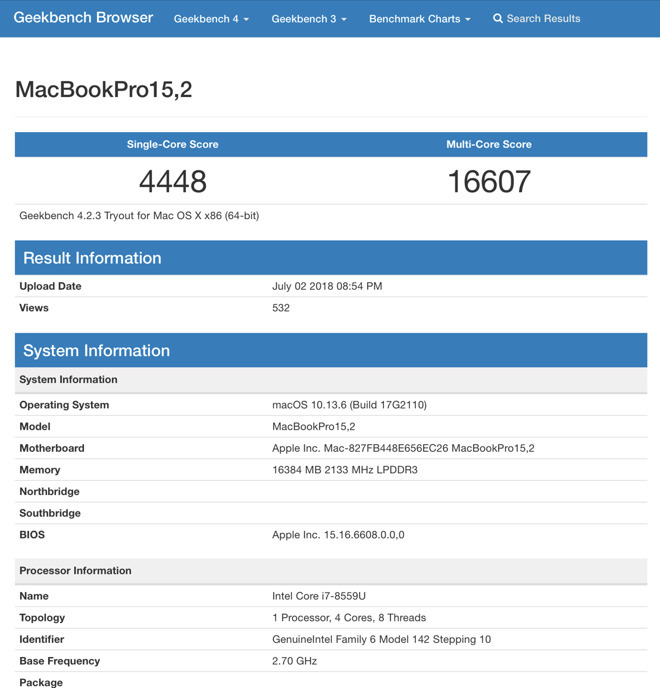 It can be remembered that the current MacBook Pro with Touch Bar released last year has a Geekbench ID of “MacBook Pro 14,2.” This increases the possibility that the entry is legit. Coffee Lake or Kaby Lake? This new MacBook Pro development refutes previous reports that the seventh-generation processors, named Kaby Lake, will be retained. While Kaby Lake is powerful in its own right, Coffee Lake is said to be faster. For example, the i7-7567U chip used in last year’s Pro only has two cores and four threads. Its turbo frequency is also only at 4.0 GHz. How great do you think will the performance of the MacBook Pro 2018 when it hits retailers? Let us know about your theories by posting entries in the comments section.